MELTDOWN: Trump Rages At "Sleazy" Press For Daring To Question Donations To Veterans Groups [VIDEO] - Joe.My.God. Donald Trump railed against the media on Tuesday morning as he released details of the money he’s raised and distributed to veterans organizations, even calling out one journalist as a “sleaze” during a combative news conference. Trump has faced pressure to release information on where the money went after he claimed that he raised $6 million — including a personal donation of $1 million — from a fundraiser he held in January in lieu of attending a Fox News debate. 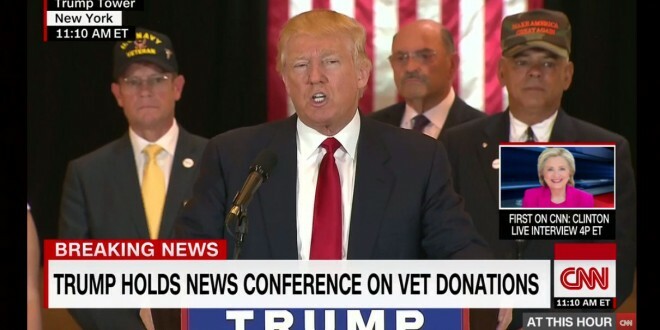 Speaking with veterans behind him at Trump Tower on Tuesday morning, the presumptive Republican presidential nominee said his campaign has sent off $5.6 million to veterans organizations, which he named one by one after tearing into the media for coverage over the disbursements. But he spent most of the roughly 40-minute press conference — which was carried live by all the major cable news networks — blasting the media, which he said should be ashamed. “What I don’t want is when I raise millions of dollars, have people say– like this sleazy guy right over here from ABC, he’s a sleaze in my book,” Trump said. “Why am I a sleaze?” ABC’s Tom Llamas could be heard asking. “You’re a sleaze because you know the facts and you know the facts well,” Trump responded. Trump just called me a “sleaze.” Should be an interesting week.